Today Edmonton Transit (ETS) officially launched its new text messaging service. You can now send an SMS text message to 31100 from virtually any cell phone to get bus schedule information for free (standard messaging rates may apply). The service is yet another example of the GTFS feed that ETS released in 2009 paying dividends. Starting next week you’ll also be able to create a profile on the website to setup favorite routes and stops specific to your daily routine. 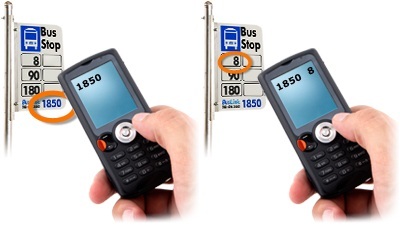 The ability to get route & stop schedules via text messaging might be new here in Edmonton, but it’s not a new concept elsewhere. Transit riders in Vancouver have had that functionality for years, first unofficially thanks to a couple of enterprising students, and later as an official service from TransLink. The story is somewhat similar here. Local developers Sean Healy and Joel Jackson hacked together a service called TXT.2.ETS back in March of last year, something they won a prize for in the Apps4Edmonton competition. They subsequently met with ETS representatives and talked about what an official service might look like. Though it is a pilot, don’t expect the service to shut down any time soon. Instead, ETS plans to monitor usage, gather feedback, and will be conducting market research later this year, and will re-evaluate and improve the service as necessary. In fact, if all goes well, the service will pay for itself and perhaps even drive an additional return to the City via the advertising service that will launch in the spring. The last 40 characters of the messages sent back to commuters will be allocated toward advertising (the “ETS – THE EVERY DAY WAY” part in the example above). I think that’s a smart move. It turns out the service has actually been live for about a month, in testing by Upside and City of Edmonton employees. Apparently there has been quite a bit of buzz internally at the City about it. Today was not the planned launch date, but the accidental release of parts of the outdoor marketing campaign pushed things up. Nathan confirmed that we’ll see lots of advertising for the new service, including billboards, benches, and transit shelters. He sounded pleasantly surprised that they had been able to keep the service under wraps for so long (no doubt the holidays helped in that regard). I had to ask Nathan the question he’s undoubtedly going to be asked over and over now that the text messaging service is live: scheduled information is great, but when are we going to get live information, perhaps via GPS? His answer: “The technologies that transit uses are always evolving, and the service will evolve as well.” In other words, nothing to announce, and don’t hold your breath. I also asked about the shortcode, 31100. Nathan said they briefly considered a repeating number (such as TransLink’s 33333) or something like “txtets” but realized that using letters would be problematic considering most modern smartphones do not have traditional numeric keypads. They settled on 31100 because it offered great potential for the future. Just like 311, other departments at the City could make use of the shortcode for their services as well. Nathan confirmed that at least one business unit outside of transportation has already expressed interest in exploring that possibility. This new service is exciting and will have a positive impact on the daily commute for thousands of Edmontonians. But it’s more than that. ETS made a decision to open up its data to anyone for free, and they continue to see a return on that very minimal investment. Releasing the GTFS data feed has resulted in Google Maps support, apps for the iPhone, and now text messaging. Importantly, all ETS had to do for all of this to happen was focus on its core competency – providing transit service. It’s a success story that other business units at the City of Edmonton should be very eager to replicate. Having said that, I would have preferred to see a solution from a local company or even the adoption of Sean & Joel’s project, but I realize there are other considerations. As the Apps4Edmonton competition evolves, I hope we’ll see the City adopting more of the solutions that Edmonton’s talented entrepreneurs create. The new text messaging service is a great way to start 2011. In fact, Nathan said it “sets the tone for the year” and indicated that ETS was going to be looking at additional opportunities to work with the community on other services as 2011 unfolds. I can’t wait! You can learn more about the service here, and you can find additional Apps for ETS here. Check out the Open Data catalogue for ETS data and more, and follow the #yegtransit hashtag on Twitter for ETS-related updates. UPDATE: Does the new text messaging service work for the LRT? The answer is yes! If you know the stop numbers, that is. The route for the LRT is always 201, but here are the stop numbers you need. Hopefully they can make it more user friendly in the future.